Convert convert MPEG to AVI, MP4 to AVI, and all other popular video files to AVI for Mac OS X users. iSkysoft Video to AVI Converter for Mac is developed to convert all popular video files to AVI and convert video to audio for Mac OS X users. It supports video formats such as MPEG1, MPEG2, MP4, 3GP, 3G2, AVI, Mpeg TS/TP (for HD Video). It can also extract and convert the audio track from your video files to Mp3 and AAC. Video to AVI Converter for Mac lets you set video brightness, contrast, saturation, crop video, trim video, batch convert your video files, and even merge multiple files into one file. 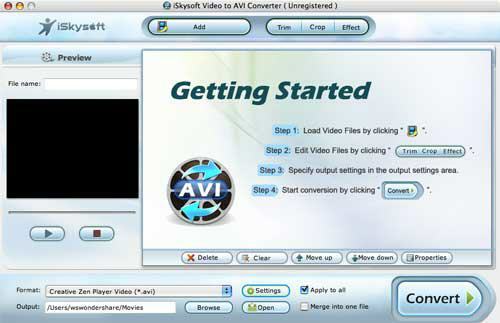 iSkysoft Video to AVI Converter for Mac can convert convert MPEG to AVI, MP4 to AVI, and all other popular video files to AVI for Mac OS X users. It can also extract and convert the audio track from your video files to Mp3 and AAC. ImTOO Apple TV Video Converter for Mac - It can rip DVD to Apple TV video MP4, can convert DVD on Apple TV and put your favorite DVD on video iPod. iSkysoft DVD Audio Ripper for Mac - An easy-to-use Mac DVD Audio Ripper which can rip DVD audio to MP3, M4A, WAV, AAC, AC3, and WMA etc for different MP3 players and audio players.